Salmon is a great source of protein and healthy fat, and these healthy recipes make it absolutely delicious. Salmon is one of the most popular fish to eat for good reason: it’s delicious, high in omega-3 fatty acids, and low in mercury. When it’s time to buy this flavorful fish, however, there’s an ongoing debate about where it should come from – the wild or a farm. And there’s no easy answer when you consider how demand is outpacing and how aquaculture technology and industry standards are evolving. Farm-raised salmon has fewer risks now than before, but it still has a larger (negative) environmental impact than wild-caught. The good news, however, is that no matter where the salmon on your table originated from, it’s going to be good for your health. And even if you’re not a big fan of salmon, some of these delicious recipes are hard to turn down! Enjoy! Take the basic breakfast of a bagel and lox to a whole new level by baking homemade muffins. Don’t worry about whipping up a batch of baked goods in the morning; bake them the day before. 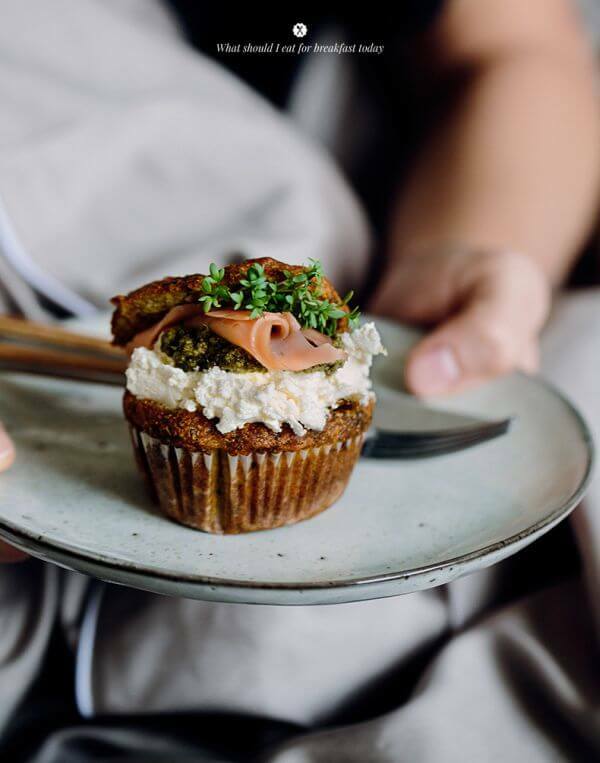 When your stomach is grumbling for breakfast, just slather on the cream cheese, spoon a dollop of pesto on top, and complete with as much smoked salmon as you can fit on a muffin. 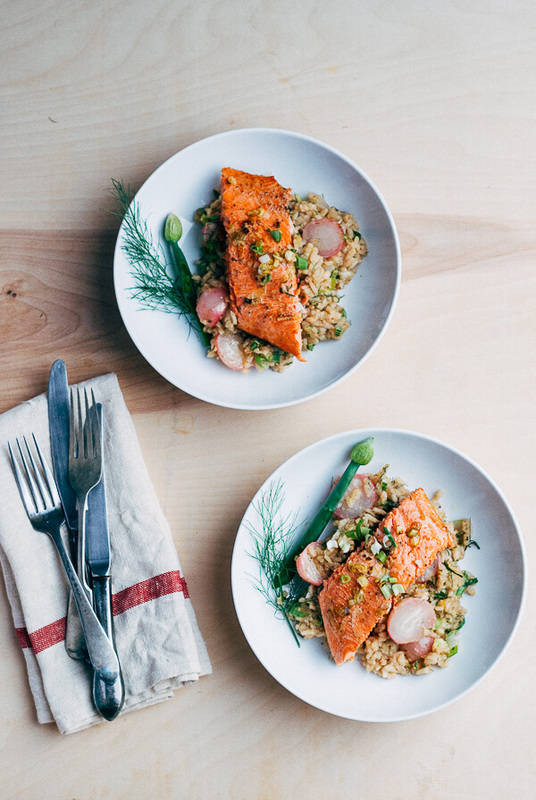 Since salmon has such a robust flavor, it’s often left to shine with minimal seasonings. 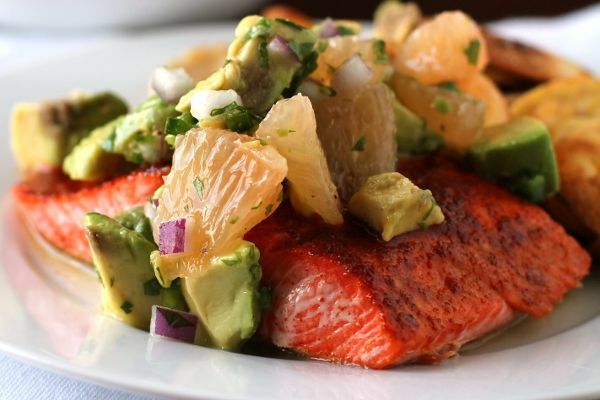 But that doesn’t mean this healthy fish can’t also complement a livelier dish, such as this one featuring two fruits: avocado and grapefruit. As a side, try serving another fruit – plantains – either mashed or made into crispy chips. Having salmon for dinner doesn’t have to be hard. When you want a gourmet dinner but don’t feel like doing any work, this recipe is exactly what you need. 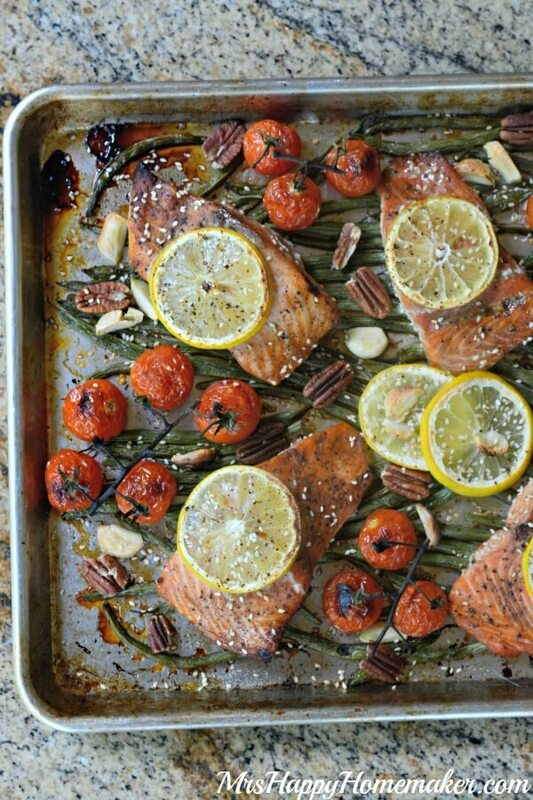 Toss all the ingredients on a sheet pan, and stick it in the oven to roast. You can even leave the ripe tomatoes on the vine. The only part of this recipe that could require real effort – making your own teriyaki marinade (like this one) – is optional. If you go for store-bought, just be sure to check the sugar content. Every now and then chocolate has been known to make its way into a savory dish, like hearty beef chili or Mexican mole sauce. But have you ever tried marinating fish with cocoa powder? 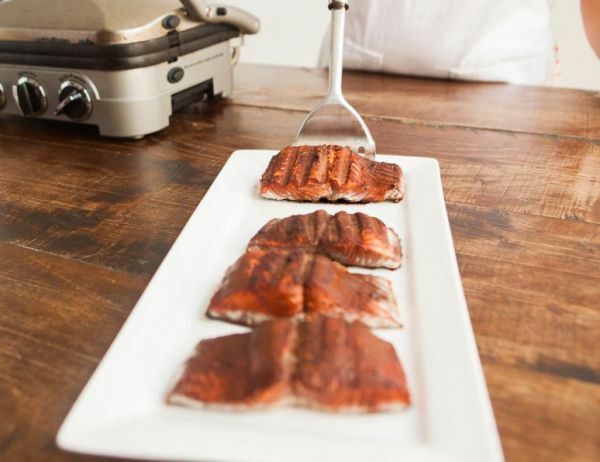 Just a little unsweetened cacao, along with smoked paprika and salt, are all you need to make these unique salmon fillets. 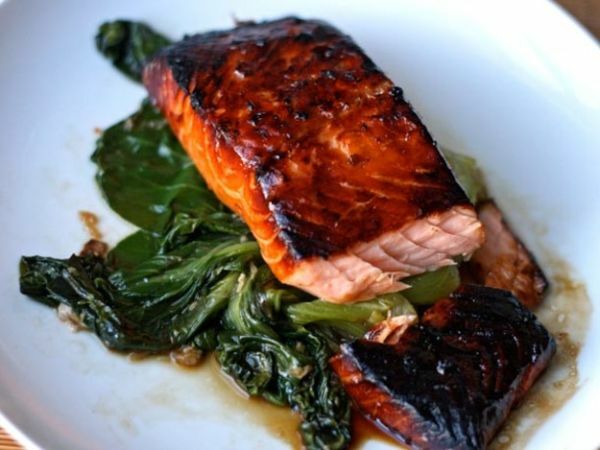 If you’re cooking seasonally in spring, this is a great way to add salmon to the menu. The fish fillet is lightly seasoned and cooked under the broiler, which only takes about 10 minutes. So you’ll want to start the risotto first, and about halfway through stirring it together, the salmon should go in the oven. There’s minimal prep work – halving onions and radishes – so altogether this gourmet dinner will be on the table in about a half hour. For a healthier hamburger, make the patty with ground salmon. They won’t be low-fat since beef and salmon have similar amounts per serving, but the quality of fat is different. 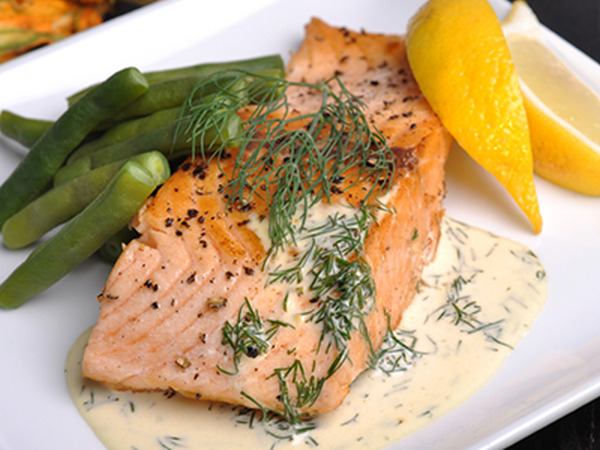 Salmon has half the saturated fat, replacing that with omega-3 fatty acids, the kind that supports cardiovascular health. 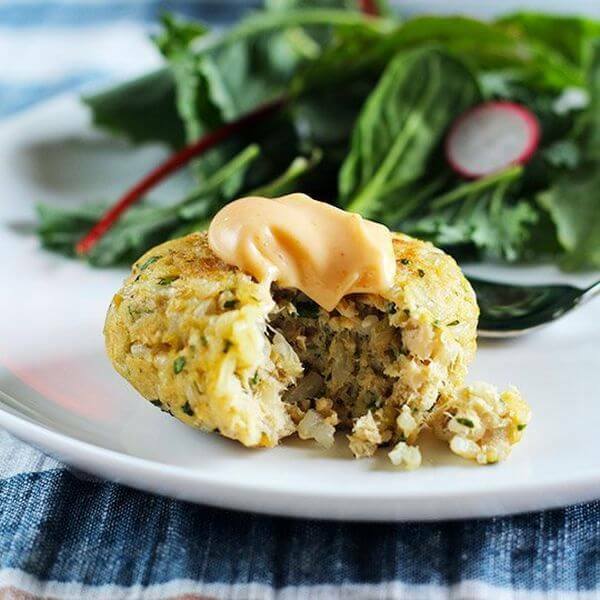 These salmon burgers also benefit from two other superfoods: kale and quinoa. Serve with a salad or a toasted bun. 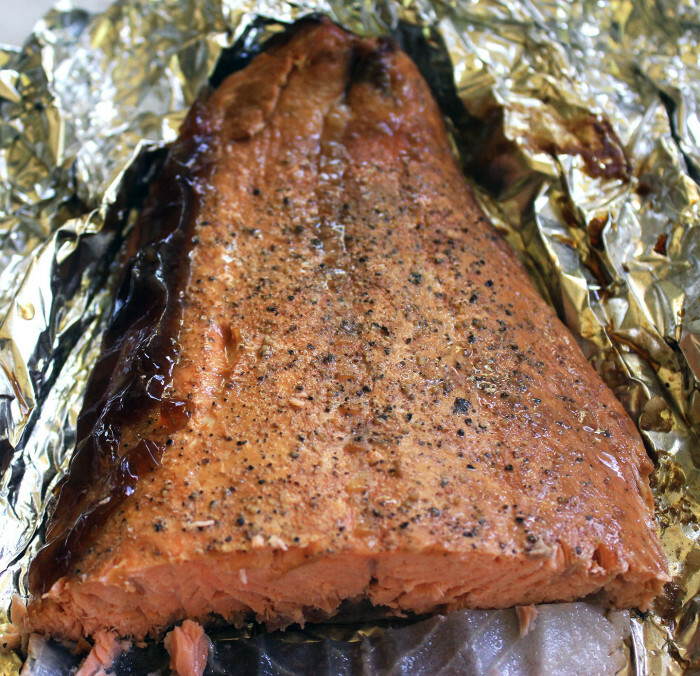 A lot of quick meals use smoked salmon, but most people pick theirs up in a plastic package from the grocery. 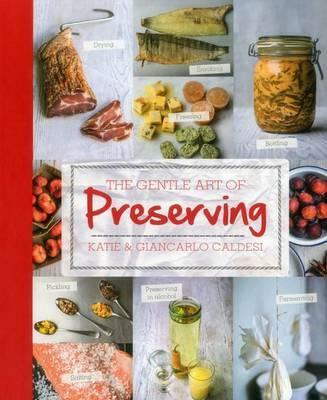 Instead, it’s easy to make your own with guidance from Katie and Giancarlo Caldesi, authors of The Gentle Art of Preserving. This method uses a Cameron Stovetop Smoker, a great investment for any meat-lover’s kitchen. The stainless steel pan, rack, and cover can be used on any indoor or outdoor heat source, including electric burners. Canned salmon recipes can go beyond seafood salad and sandwiches. 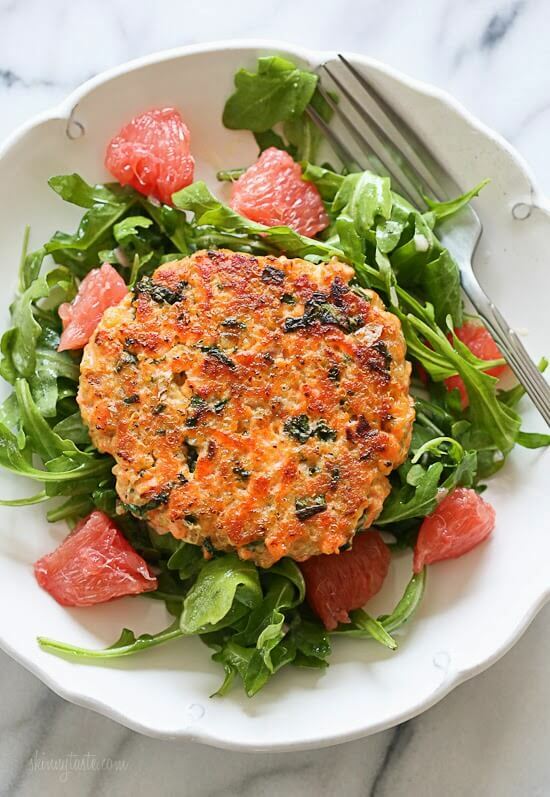 These salmon cakes come together quickly and can be prepared a day ahead. When you’re ready to eat, heat up an oven-safe frying pan, and bake for 10 to 15 minutes. Alternatively, you can brown them in a skillet. While you wait, stir Sriracha into mayonnaise (or yogurt). Looking to quickly season a salmon fillet with whatever you have in the pantry? This delicious marinade will make a dinner that reminds you of succulent restaurant salmon, but it takes hardly any time and requires little kitchen skill to put together. This salmon is infused with barbecue flavor because of a pineapple marinade, but there’s no need to heat up the grill since it’s so quick to bake fish in the oven. At the same time, you could roast some veggies like broccoli, green beans, or carrots for a side dish. Or, while the salmon is in the oven, assemble a simple salad. 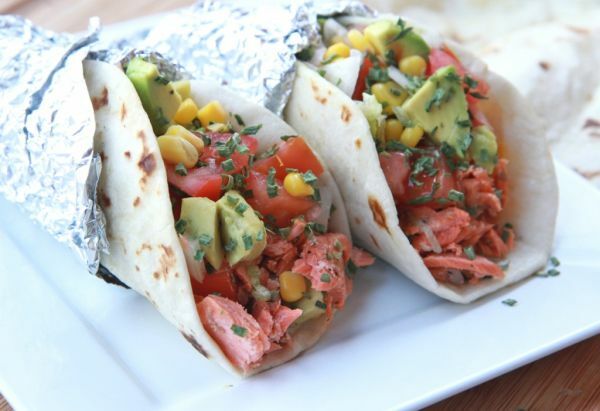 Fish tacos usually feature a tender white meat like mahi mahi, but there’s no reason you can’t use salmon instead for a more filling, more flavorful version. This recipe will have you developing even richer flavor by browning butter, and a splash of citrus and honey makes them absolutely addictive. Finish with your favorite toppings, like tomatoes, avocados, sweet corn, red onions – and don’t forget a dollop of sour cream or Greek yogurt. Despite the name, wheat berries aren’t fruit. They’re wheat seeds, and they retain a lot of the plant’s nutritional benefits because they are completely unprocessed. 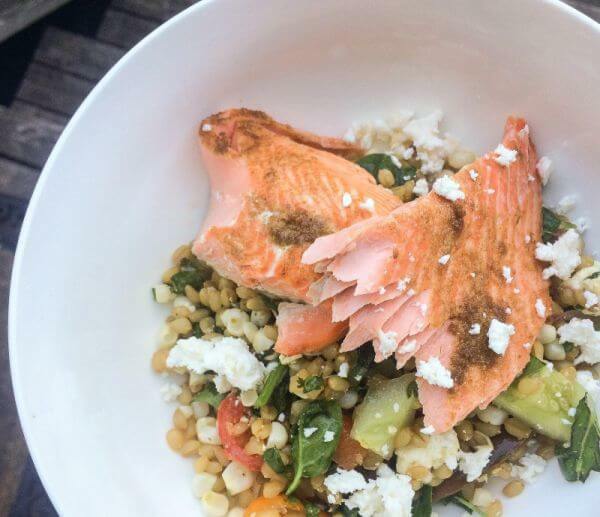 In this summery salad, wheat berries contribute 9 grams of protein per serving, yet only a gram and a half of fat. 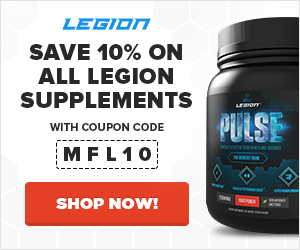 Additionally, they pack a lot of fiber, magnesium, potassium, and vitamins. This salad will be delicious on its own, but it’s even better tasting with greater nutrition if you have leftover salmon to add to the bowl. This healthy dinner is inspired by spaghetti and meatballs, but it’s far from the classic. 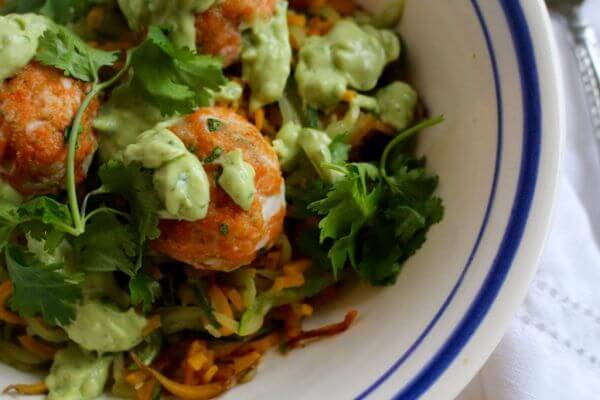 Instead, salmon meatballs are nestled in a bowl of zucchini ribbons and sweet potato pasta. Of course, you can also serve them with regular pasta, but the dish will actually be less flavorful that way. With vegetable noodles and a creamy avocado sauce, this is a healthy and delectable way to enjoy the tastes of summer. Salmon isn’t just good with potatoes and asparagus. 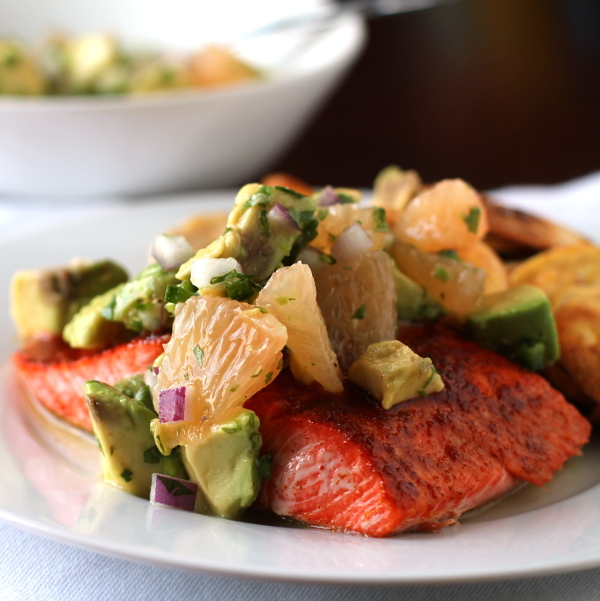 A tender filet of salmon also tastes amazing with fruit. 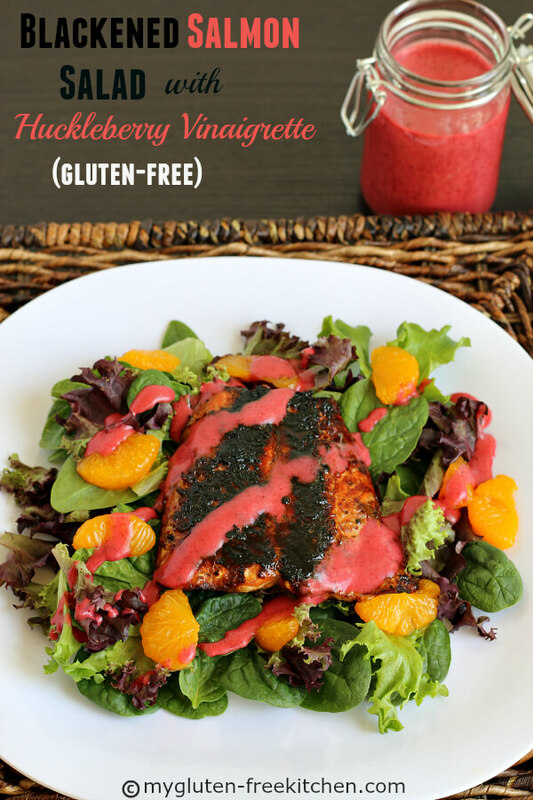 This salad has mandarin orange slices, as well as a huckleberry vinaigrette. If you can’t find huckleberries near you, any kind of blackberry will work instead. No matter what fruit you’ll use, the recipe will make enough salad dressing for several meals. The macros below assume there are about 16 servings of this vinaigrette, adding about 90 calories and 9 grams of fat. 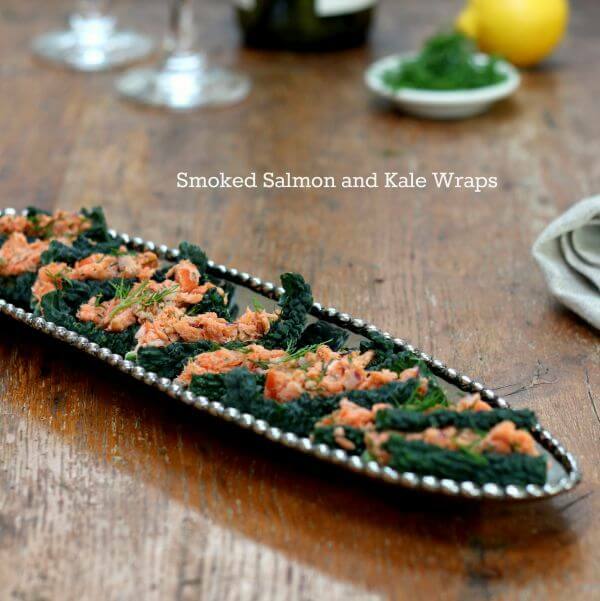 These salmon wraps are as easy to make as they are to eat. Planning to serve these at a party or gathering? Make extras in case this salmon appetizer gets gobbled up in minutes. If you end up with leftovers, all the better. The salmon tastes great whether served warm or cold. Stash them in the fridge, and you’ll have a delicious, nutrient-rich snack to enjoy anytime you’re craving some protein. When you’re planning an extra special backyard barbecue, you might want to upgrade from hamburgers and hot dogs, or offer an alternative for friends who are watching what they eat. 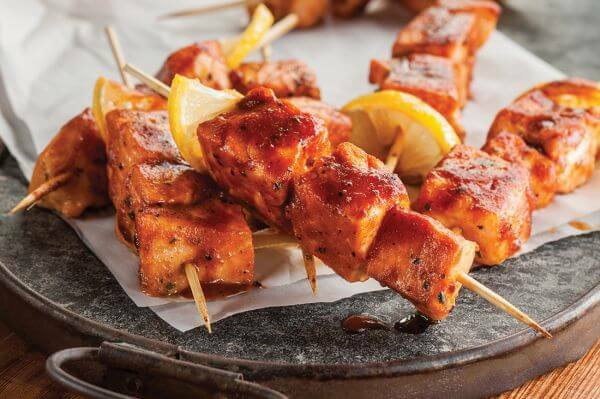 These salmon kabobs are perfect for any occasion, even just a regular weeknight. If you don’t feel like grilling kabobs, simply broil them for about five minutes. Serve with rice, quinoa, or veggies. If you’re afraid of overcooking salmon and turning a perfectly good filet of fish into a dry dinner, try poaching it. It’s easier than you think. 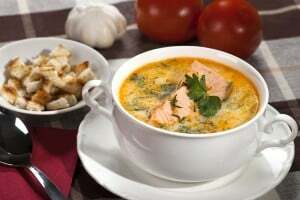 You can use water, of course, but the salmon will taste even better if you use a flavorful poaching liquid like broth, white wine, and lemon juice. Bring it all to a boil, and allow the fillets to simmer, fully covered, until the fish flakes apart. Forget about dry meatloaf. This version uses tender salmon, full of healthy fats, and it’s served with a creamy cucumber sauce. Yet as sumptuous as it is, this healthy dinner has less than 200 calories per serving. 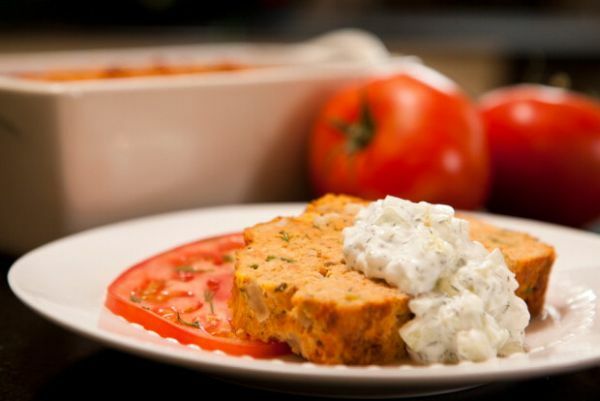 The sauce combines yogurt, fresh cucumber, onion, and dill, so if you aren’t in the mood to make it from scratch, you can pick up tzatziki from the store to pair with the salmon loaf. 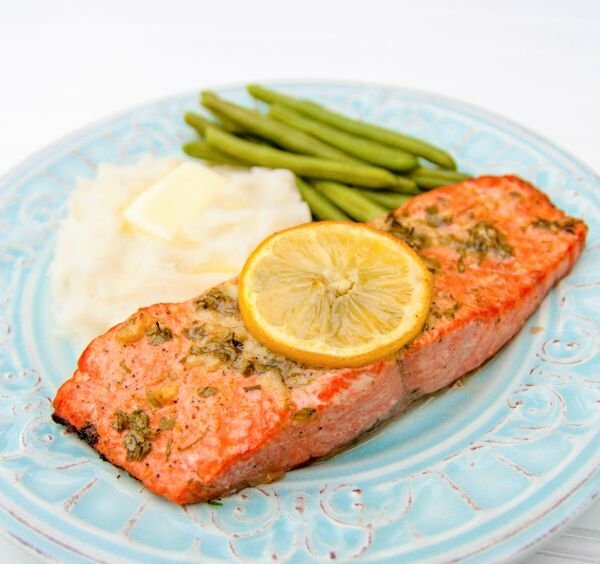 Since this fish is delicious when baked or pan-roasted with minimal seasoning, salmon steaks are often served in a low-key style with vegetables or a salad. But that doesn’t mean salmon, like big chunks of beef, can’t be stewed into a thick soup. This luscious chowder incorporates shellfish, mussels, fish stock, and saffron for an ocean flavor you won’t soon forget. 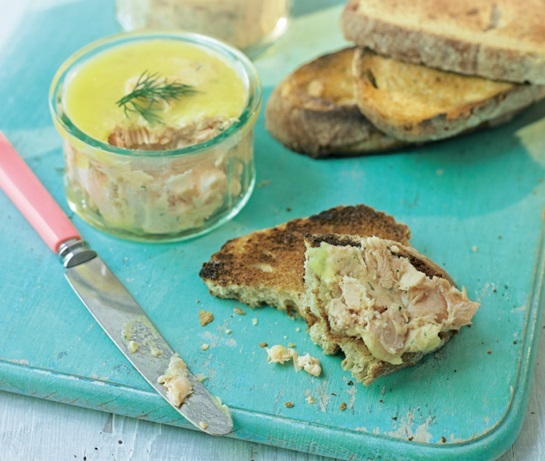 Although potted salmon may seem new and unfamiliar, it’s a traditional food along the British coast. This is a great make-ahead dish to bring to a picnic potluck or to serve as an appetizer before a dinner party. Pair it with garlic crostini or nutty bread for a simple but stunning take on salmon. What did you think of these healthy salmon recipes? Have anything else to share? Let me know in the comments below!